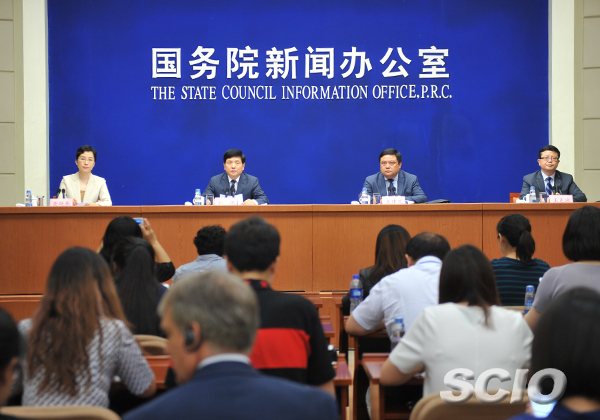 Officials of the Ministry of Finance introduced China's fiscal and monetary policies at a press conference held by the SCIO on July 28. Ladies and gentlemen, good afternoon. Welcome to today’s press conference. We are delighted to invite Mr. Liu Wei, vice minister of finance, to introduce China’s fiscal and monetary policies and answer some of your questions. Also present are Mr. Wang Jianfan, director-general of the Tax Policy Department of the ministry, and Mr. Wang Kebing, vice director-general of the Budget Department of the ministry. Now, let’s welcome Mr. Liu Wei to provide his briefing. In the past six months, the Ministry of Finance has concentrated on supply-side structural reform, and launched a proactive fiscal policy, ensuring China’s economic performance would remain stable and would move in a positive direction. First, Stepped-up efforts to cut taxes and fees. We continued to ease the corporate tax burden. Measures taken included: implementing and improving the program to replace business tax with VAT in all sectors of society; simplifying the structure of VAT rates; halving corporate income tax for an increasing number of small and micro businesses; providing tax credit policies to more enterprises investing in business start-ups; widening the scope of tax deductions for R&D expenses of high-tech small and medium-sized enterprises. We also made more efforts to cut fees. Measures taken included: overhauling and exercising standard-based management of administrative fees and government-managed funds; releasing the lists of administrative charges of central and provincial governments on the website of the Ministry of Finance; launching short-term policies to lower premiums for unemployment, reduce logistics and energy consumption costs of enterprises, and reduce business and service fees and charges. These policies and measures are expected to save enterprises 1 trillion yuan in taxes and fees this year. Second, Improving management of budget implementation. Regarding central government’s transfer payments to local governments, by the end of June, we had carried out most of the appropriations to local governments, while the remaining funds are for special items, such as payments to those needing settlement by actual spending. We deepened reforms to introduce a system for the treasury's centralized revenue collection and expenditure payments. Government funds, allocated and transferred in a timely way were also put to better use. We speeded up the process of making budgetary funds available for fiscal expenditures. In the first half of this year, the growth rate of national fiscal expenditure was six percentage points higher than fiscal revenues. The proportion of budgetary expenditures implemented was 0.7 percentage points higher than the same period last year. We improved performance-based budget management. Besides the general public budget, some government-managed funds and State capital operations were also placed under closer supervision. Third, improved people's living standards. Precise measures are being launched to alleviate or eliminate the prevailing impoverished conditions, with special attention being paid to the most affected areas. Funds for the agricultural sector have expanded from the pilot poverty-stricken counties to the entire impoverished area and local government attempts to alleviate poverty by asset incomes are being buttressed.We have unified policies whereby Chinese students receiving compulsory education are exempted from paying tuition and fees and paying for textbooks and a subsidy will be provided for the living expenses of students from families with financial difficulties, so that the exemptions can be deemed valid everywhere. Funds for the needy group have been better integrated and the local governments are expected to better assist people with minimum incomes or those suffering severe poverty. Meanwhile, more efforts have gone into healthcare and great importance been placed on efforts to protect the air, water and soil from pollution through programs of ecological conservation. The government has placed more importance on the most impoverished areas where the shortage of resources and energies leads to fiscal difficulties. Fourth, tightened control of local government debt. The fundraising programs by local governments have been further regulated. There are clear guidelines for the issuance of local government bonds. We have improved the system for local governments' special debt and a mechanism in response to risks and emergencies has been established. At the same time, a regular institution overseeing local governments' debts has also be established. In the past few months, the joint efforts of macro-economic policies, such as fiscal policy, have ensured the sound and smooth development of the national economy and the execution of fiscal budgets has also performed well. During the first half of this year, the National General Public Budget Revenue hit 9.4 trillion yuan, up 9.8 percent year on year--an increase of2.7 percentage points compared to the same period last year and 5.3 percentage points higher compared to the figure of last year's total. By slashing considerable amount of taxes and fees, revenue during the past six months surged above expectations, which demonstrates the sound and positive development of the national economy. The improved economic structure, the resurgence of the service industry, the positive balance sheet of enterprises and the growing imports and exports have laid a good foundation for increased revenue. At the same time, the growth also partly resulted from the rise of the producer price index (PPI) as well as the price hike of bulk commodities. The structure of the revenue has changed positively. During the first half of this year, tax revenue growth constituting 92.9 percent of the entire increase, 13.3 percentage points higher compared to the figure of last year's total. The value-added taxes, including industrial and commercial VAT, enterprise and personal income taxes and taxes on imports, maintained double-digit growth. The secondary and tertiary sectors,accounting for 47.5 percent and 52.3 percent respectively, have contributed considerably to the growth of tax revenues. Considering the tax growth of different sectors, the reduction of excessive capacities, supply-demand reform and the surging prices of products led to tax increases in the energy and raw material industries; the constant driving force of the improved industrial structure produced an increase of taxes from medium or high-end manufacturing industries and the shift of growth drivers and emergence of the new market demand brought about the rapid tax growth in cultural, sports, the internet and IT sectors. In regard to regional economies, the growth basically can be seen in balance, with 11.3 percent and 10.7 percent respectively in the middle and western areas and 9.3 percent in the east. In the first half of this year, the National General Public Budget Expenditure hit 10 trillion, constituting 53.1 percent of the planned budget, and registering growth of 15.8 percent year-on-year. The growth rates of education, science and technology, social security and employment, healthcare and family planning and energy saving and environmental protection were respectively 17.2 percent, 22.7 percent, 24.6 percent, 18.2 percent and 39.8 percent. The Ministry of Finance, in the following phase, will continue to comply with the strategic policy decisions made by the CPC Central Committee and the State Council, uphold the consistency and coherence of the policies, implement proactive and effective fiscal policies, fend off the risks of local government debts generally guided by the supply-side reform, curb the growth of hidden debts and ensure the sound and stable development of national economy. I will conclude my report here and move onto the question-and-answer session with my colleagues. Thank you. Thank Mr. Liu Wei for his introduction. Now, the floor is open to questions.